In the war on terror, Trump doubles down on a failed strategy. On August 21, U.S. President Donald Trump unveiled his long-awaited Afghanistan strategy. He made clear that the longest war in modern U.S. history had no end in sight, and that the U.S. government would increase its troop contingent by several thousand soldiers. According to news reports, another 4,000 U.S. soldiers are slated for deployment to Afghanistan. However, Trump himself admitted the true numbers will remain in the dark, saying in his August 21 speech that the number of U.S. troops deployed to Afghanistan, Iraq, Syria and other countries would not be released by his administration in the future. Nine days later, it was revealed that, instead of roughly 8,000 troops, as previously believed, at least 11,000 soldiers are currently deployed in Afghanistan. That’s not the only instance of information being withheld from the public: During the last days of Barack Obama‘s presidency, the Pentagon stopped releasing redacted investigations of major civilian casualty events caused by the U.S. military. This included war crimes in Syria, Afghanistan and several other countries where drones are haunting the skies, while special forces units are conducting shadowy operations on the ground. Although the word “terrorist” has become vacuous, a label for everything and everyone, the question remains: Who are the “terrorists” in Afghanistan? Are they al-Qaeda, which has been practically non-existent in the country for years? Are they the leaders of the Taliban, which has grown since the start of the U.S.-led invasion and now controls many parts of the country? Are they the extremists of ISIS, whose presence was enabled by the violence of the U.S.-led war and invasion, too? Are they the brutal warlords and militia fighters who have become a crucial part of Afghanistan’s landscape and, since allying with the United States in 2001, have led parts of the Kabul government? From an Afghan view, there are other “terrorists”: the drone operators who are remotely killing innocent people on a daily basis, or the Western soldiers who are hunting civilians and collect their body parts like trophies. For the U.S. government, the answer is chillingly simple. Since 2012, the White House has maintained that every military-aged male in a strike zone is considered as an “enemy combatant.” This means what nearly all Afghan men—including teenagers—are considered “terrorists.” The same is true for Syrians, Iraqis, Pakistanis, Somalis, Yemenites and every other citizen of a country that has the luck to be terrorized by U.S. bombs and rockets, dropped by conventional aircraft or weaponized drones. “We are all terrorists. If we get hit now, you are going to be called like that too,” a Taliban fighter in Nangarhar province in the east of the country told me when I visited his village in May. Local civilians who were nearby agreed with him. What he said was true. I often thought how I would be described after getting killed by a drone strike, especially while researching in remote regions that are barely entered by Western journalists. Like most Afghan men, I have a beard and black hair. In today’s world, that’s enough to be called a “terrorist,” a danger to Western civilization. Since Trump took over the presidency, about 2,000 airstrikes have been conducted by the U.S. military in Afghanistan. On October 12, a U.S. drone strike killed 14 people; Afghan officials claim the victims were ISIS militants but a local member of parliament alleges those killed were civilians. Last month, the U.S. dropped more bombs and missiles on Afghanistan than in any other month since 2010. 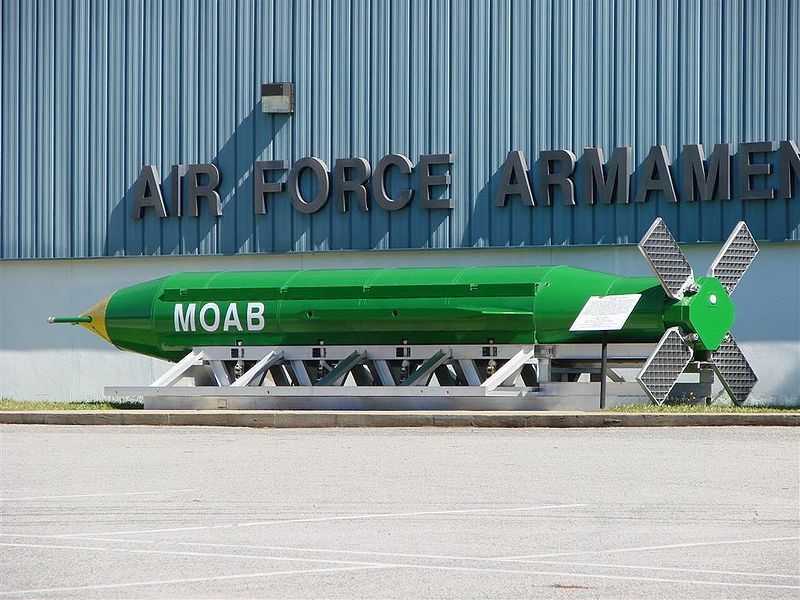 Most of these strikes hit Nangarhar province, which was also the target of the Massive Ordnance Air Blast (MOAB), also known as the “Mother of All Bombs”, the most powerful non-nuclear weapon in the Pentagon’s arsenal. According to recent UN data, U.S. strikes in Nangarhar are more likely to result in civilian casualties than strikes anywhere else in the country. But contrary to reports that often describe all victims as “suspected militants” or “terrorists,” many dead are civilians. Provinces like Nangarhar, where the United States has been fighting its “War on Terror” since 2001, are the places where the U.S. lost this war. 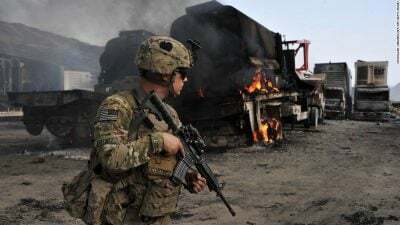 While the Taliban control many districts of such provinces, after years of constant occupation, many Afghan locals have developed a hatred toward the American soldiers, like their forefathers did towards the Russians and the British. While Trump is giving one weird speech after the other, the Afghans in these remote areas live in real dystopia. The so-called government in Kabul, which was installed by the United States in 2001, has no influence here. Instead, the people’s lives are controlled by Taliban insurgents who are often deeply connected with the local communities. More than 100,000 U.S. soldiers, who were deployed in Afghanistan during the Obama era, were not able to change this reality. It will not be much different under Trump. It’s not just the mere presence of foreign troops that fuels war, but also what those troops have done and continue to do: carry out air strikes, conduct brutal night raids on civilians’ homes and torture detainees at places like Bagram Air Base—a place so notorious in Afghanistan that, to some, Guantanamo is considered a haven by comparison. All signs indicate these atrocities will continue in the era of Donald Trump. 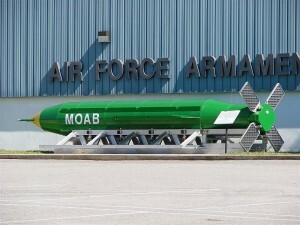 The identities of the people who have been murdered by the MOAB are still not known. While the Kabul government supported the attack and later announced that more than 90 ISIS militants have been killed, the White House preferred to stay silent. Too often, similar figures in the past have proven to be bogus. But in the United States, the stories of Afghans are only told when they fit with the interests of the U.S. empire. Otherwise, they remain faceless and invisible—and that’s how Donald Trump wants to keep them. Emran Feroz is an Austrian-Afghan journalist and author based in Germany, and the founder of Drone Memorial, a virtual memorial for civilian drone strike victims. His book on the U.S. drone war just has been released in German.